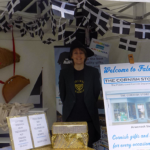 We had a super summer meeting all you lovely people visiting us in Falmouth, Cornwall! On 31st August we had a super surprise! 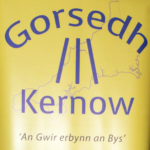 The Gorsedh Kernow honoured us by presenting us with the Community Awardat an Awards Ceremony held in Launceston. 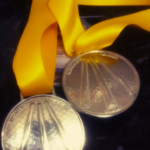 These are our Awen Medals.Awen is a Cornish, Welsh and Breton word for “(poetic) inspiration”. Awen is the inspirational muse of creative artists in general: the inspired individual. Also at the end of August we had another surprise, but sadly not a happy one.Our lovely Sharon had a stroke. She is recovering extraordinarily well and should be back with us for a few hours a week in October. 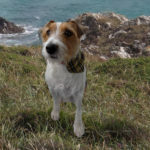 Ansome Harry is taking us on holiday.He’ll be kitted out in his new Cornish designer Doggy wear to prove that it’s not just Scottie Dogs and Westies who have tartan!